You are here: Home / Blog / The Cost of Software Licensing in Networking – Is the Price Worth It ? 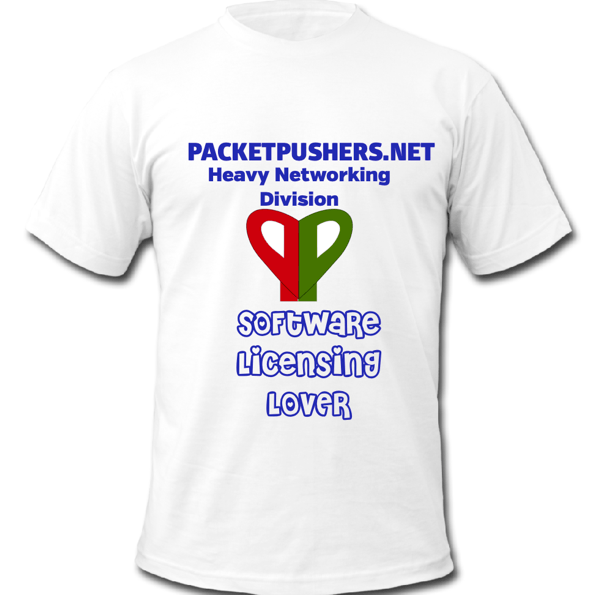 The Cost of Software Licensing in Networking – Is the Price Worth It ? I’ve been evaluating Cisco Nexus products for a customer. So far, its taken more than 10 hours to check which product licenses are required for each platform. And I’m still not confident that I’ve got it correct and accurate. The licenses are convoluted and I’m really worried that I’ll pick a license and miss the features that I need. So I checked with the reseller engineer and he doesn’t know either, “that is more of a sales thing” he said. The inside sales person said “I’ll need to the engineer to advise me on that”. I once worked on a project with staff from Cisco Professional Services where it took 3 days to build and validate the bill of materials – specifically on the software licensing required for some Nexus switches. At the standard rate of USD$3000 per day for Cisco PS plus my agency day rate at $1500/day, that bill of materials cost the client $13,500. Total vendor purchase was approx. $200,000. Some time ago, I met with a company that has networking licensing team. These people have a full-time position managing the licensing of network software. Not hardware, just software, feature licenses, maintenance programs. So operating a network means we will soon have licensing professionals ? Microsoft has a certification for “Volume Licensing Specialist” to manage the complexity of administration. That’s ridiculous. I last ranted about Cisco licensing in September 2012 Rant: Cisco claims “We’re Listening” to Simplifying Cisco Software Licensing – EtherealMind. Two years later and not much has changed. While I’m wasting time reading manuals about licensing, I’m not working on an SDN Strategy or adding value to the network. That expensive network equipment with a shedload of useful features isn’t returning the investment I promised. The CIO and project managers complain about long lead times, knows that this isn’t getting value from the investment. We all feel helpless in the face of vendor business models because we just wants to get the job done and improve the network. There is no right answer here. But the cost of selecting software licenses is getting to be more than the licenses. That’s ridiculous. This makes me think about several different podcasts all at once. You had commented about how some organizations won’t move without a CVD that backs up the plan. On another point of the triangle, you have open source (read: license is free, cost = service). On third point of the triangle, you have the white box implementations that you blogged about recently. Because you can’t presumably reveal the IP of the company you did a white box for and the open source movement hasn’t come up with a reliable recipe for deployment, there is no pressure on Cisco to improve. I’m confident Cisco’s Byzantine licensing would get a move on if architects like yourself could offer the kind of turnkey solutions that a company wants. Additionally, if a certain set of features had been reproduced with open source, then it could be sold to c-suite. I see the hurdles as documentation, IP, and risk aversion. Creating CVD documentation is a gigantic undertaking, something the average IT department or small group does not have the time for. The IP issue is two fold, open source solutions require this firmware with that white box with this software in order to be valid. Also, we have the above mentioned problem of revealing how a company derives its IT advantage. Finally, selling this DIY kit to the execs requires them to get over the “nobody gets fired for buying Cisco” theme. When the software becomes an open source commodity and services cut into profit margins, only then will you see change. I’ve worked for Cisco partners for the last 10 years. Licensing is the single biggest issue we face. Looking at how licensing is structured, you can see they have a cubicle warehouse somewhere filled with B-School analysts whose sole purpose is to monetize every network function that they can breakout into a separate SKU. At a certain point, this started to actually work against Cisco by causing so much complexity that the local sales office doesn’t have clue. We had one customer with a large Cisco wireless deployment that is currently switching to a competitor because just figuring out the licensing to upgrade what they had was serious (read expensive) project. The new equipment works better and is easier to manage. The 12 step road to recovery won’t start until they first comes to grip with seriousness of the problem. I knew someone who loved HP Procurve switched for just that reason, no licencing at all. If you have the hardware, everything worked. Rather limited, I know. I can understand. I worked for a VAR that sold Cisco Network gear and HP servers. Cisco Licensing and SmartNet took a huge amount of time, much of it unbillable. One customer that was due for a forklift upgrade asked if we could compare Cisco to HP Procurve. Cisco won the technical bake off, although HP did OK.
HP hardware was less than half Cisco’s, but once licensing and SmartNet were added in, the 5 year HP cost was less than 1/4 Cisco’s. Their Network Architect summed it up best: “Cisco may be better, but it is not four times better.” Four years out and their network has been solid and they have added Avaya VoIP and Aruba Wireless. Cisco may want to pay attention. I agree with most of what you have said, however some customers have access to “Cisco Commerce Workspace”. This tool allows you to build complex configurations, and it provides a validation check to make sure that you included all required items, and that all the items are compatible. . This tool saves VARs from tedious back and forth quote updates, and lets them deliver real value of technical recommendations. At the same time, it empowers customers to determine the cost/benefit of each option available to them.